The interaction of species, ecosystems and processes is dynamic and links multiple scales (from centimetres and days to hundreds of kilometres and millennia) that collectively shape biodiversity.8 In a forest, for example, interactions across the range of scales include: physiological processes that affect the life cycle of leaves; competition between neighbouring plant species that affects populations; disturbance and predation processes; and climatic processes that influence the physical and biological character of landscapes and regions. a The first published use of 'biodiversity' was in 1988, in the title of the proceedings of the first U.S. national conference on the subject, edited by Wilson (Biodiversity, National Academy Press, 1988). Complex concepts such as biodiversity are often easier to grasp if reduced to their component pieces. While this approach does not give a complete picture of how these pieces interact and combine to create biodiversity, it helps us understand different aspects of biodiversity. The various levels of organization within biodiversity (e.g., genes, species and ecosystems) express different features of the complexity and value of biodiversity and interact with each other through ecological processes. Genes make up species, and species (linked by ecological processes) inhabit ecosystems (Figure 2), with smaller ecosystems nested within larger ones. Ecosystems vary enormously in size.11 They may be as tiny as a drop of pond water or a glacial rivulet, or as vast as the Stikine River watershed, the northwest Pacific coast or the whole planet. 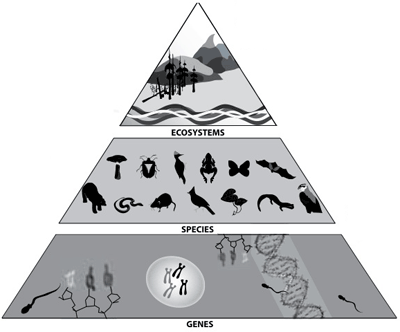 Figure 2: Conceptual pyramid of levels of organization of biodiversity. Genes are the working units of heredity; each gene is a segment of the DNA molecule that encodes a single enzyme or structural protein unit. Genetic diversity is the foundation of all biodiversity. Genetic variation permits populations to adapt to changing environments and continue to participate in life's processes. Study of subspecies and populations can reveal how organisms respond to their environment, which may not be evident when looking only at the species level. Genetic diversity is continuously changing from generation to generation as a result of natural selection and random effects such as mutation. In the long history of life on earth, genetic variants of many species have evolved, and are still evolving, in response to changing local environmental conditions. For example, the current, highly productive runs in the Bristol Bay sockeye salmon (Oncohynchus nerka) fishery in Alaska originated from low-producing runs that responded to mid 1990s climate changes.12 Figure 3 illustrates how genetic variations influence the fur colour of the American black bear (Ursus americanus), which occurs as different colour morphs (see also Section 2.4.1.2, p. 75). Species (and their subspecies and populations) are generally considered to be the only self-replicating units of genetic diversity that can function as independent units. In the case of most living organisms, each species generally represents a complete, self-generating, unique ensemble of genetic variation, capable of interbreeding and producing fertile offspring. Some animals13 and many plants14 can also exchange genes through hybridization, which sometimes results in new species (see Section 2.4.1.4, p. 82). Sustaining a species over its entire range helps to maintain its genetic variation. Within black bears, part of that variability is evident in different colour morphs, such as the rare white coastal morph (known as the Kermode or spirit bear), the more inland cinnamon morph, and the common, widespread black morph. There also is a bluish morph, known as the glacier bear, in the extreme northwest of the province. In addition to the millions of species that biologists have already documented worldwide (ranging from microscopic viruses and bacteria to large mammals), many millions more have yet to be identified and categorized. When species become extinct, diversity is lost at both the species and genetic levels and cannot be recovered. Species, like genes, do not exist in isolation. They interact with other organisms in groupings called communities. Retaining all member species helps maintain community resilience. An ecosystem is a dynamic complex of plant, animal and microorganism communities and non-living (abiotic) elements, all interacting as a functional unit. An ecosystem's character changes as community members and physical contexts change, sometimes crossing a threshold of tolerance within the system that results in its inability to return to its previous form. For example, severe winter temperatures regulate the survival of mountain pine beetle (Dendroctonus ponderosae) larvae.15 Without this controlling mechanism, the increase in larval survival over a period of years can result in a major shift in the character of interior pine forest ecosystems. Text box 16 (p. 105) describes the impact of the current mountain pine beetle epidemic on B.C. forest ecosystems. Besides being examined at the various levels of organization, biodiversity can also be described in terms of attributes such as composition, structure and function. Figure 4: Patch size requirements vary by species. Members of different species use space differently and have varying abilities to traverse compatible and hostile patches, and to avoid isolation. Source: Adapted from original by F. Bunnell and I. Houde, University of British Columbia. illustration: Soren Henrich. Composition is the identity and variety of an ecological system. Descriptors of composition are typically lists of the species resident in an area or an ecosystem. Measures of composition, such as species richness and diversity of species, can help demonstrate how biodiversity in an area is faring. Structure is the physical organization or pattern of a system; for example, the size and spacing of trees in a landscape. Measures of structure, which often describe the habitat of species, reveal arrangements and patterns in both living and non-living components of the environment. 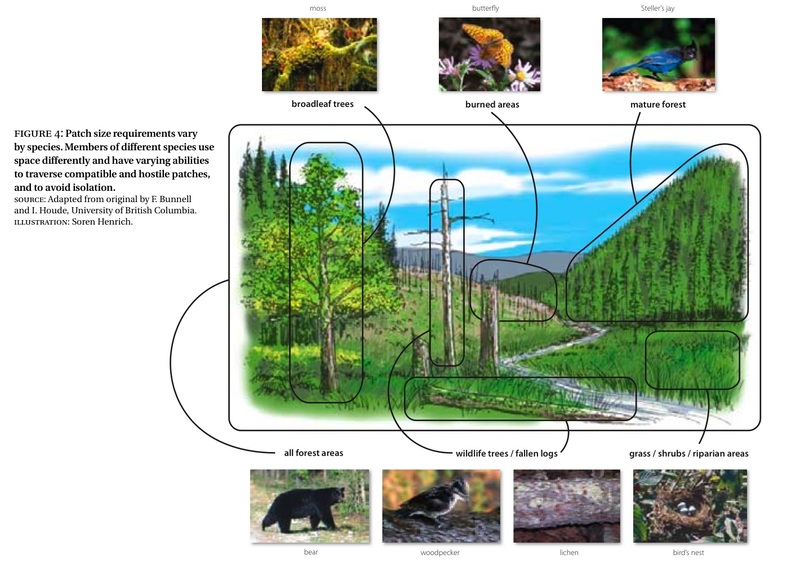 These necessarily span a wide range of scales and patch sizes to encompass the natural range of life forms and the ways they respond to the environment (Figure 4) and include the mosaic pattern of communities across landscapes. Function refers to the result of ecological and evolutionary processes. Examples of function include gene flow (resulting from processes such as dispersal and reproduction) and nutrient cycling (resulting from processes such as photosynthesis and decomposition). Measures of a function must be designed specifically for that function, and perhaps for each of its component processes. For some of the most critical functions, including water purification, nutrient cycling and pollination, scientists know only a fraction of the species and processes involved - and not necessarily the most important ones. Many people believe that humans have a moral obligation to protect all life forms for their own sake, as well as for their value to future generations. A world without the services provided by species and ecosystems is unimaginable. For example, if major groups of decomposer organisms were to fail, organic debris would simply accumulate, and nutrient cycling, plant growth and food production would come to a halt. Pollination of food plants by insects accounts for about one of every three mouthfuls of food eaten by humans.27 While some species could disappear with little measurable impact, many of the species responsible for the critical ecosystem services required for life and human well-being are unknown. Conserving biodiversity maintains options for future generations. a To put this in context, the global gross national product was around US$18 trillion per year. Figure 5: Services derived from biodiversity that support human well-being. Source: Secretariat of the Convention on Biological Diversity. 2006. Global Biodiversity Outlook 2. Montreal, PQ. 81pp. Available at: www.biodiv.org/gbo2/default. shtml. fair and equitable sharing of benefits arising from the use of genetic resources. The Canadian Biodiversity Strategy is Canada's response to the CBD. In 1996, federal, provincial and territorial governments agreed to use the Canadian strategy as a guide to their actions and to implement it according to their own priorities and fiscal circumstances.29 A number of provinces and territories have developed biodiversity strategies and action plans, and others are in the process of developing them. 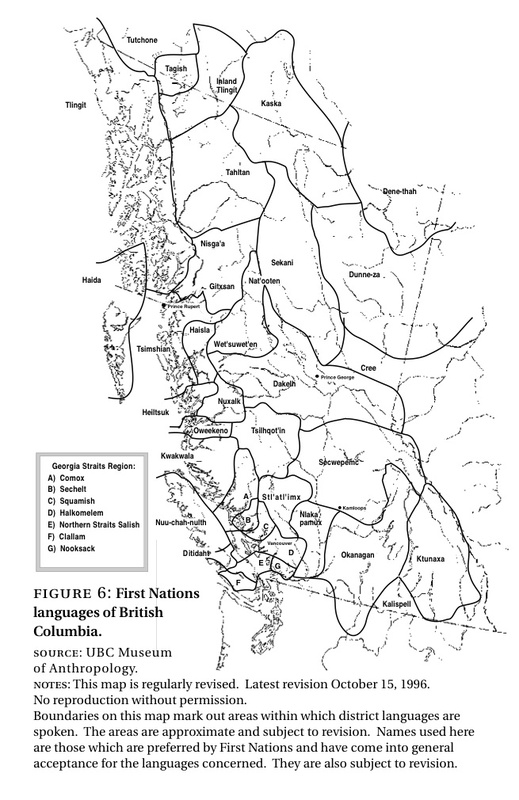 First Nations in B.C. have relied on, and helped to sustain, biodiversity in their home territories for at least 10,000 years. More than 30 linguistically distinct indigenous groups have resided here, often in dense populations, especially along the coast and the major river systems. Many of these peoples still live in communities within their traditional territories. Although they have distinctive languages (Figure 6) and cultural traits, they also share many similarities in their cultural practices. Plants, animals and fungi are also prominent in First Nations' belief systems, art, songs and ceremonies.38,39 Ceremonial species and those featured in art and narrative are often the same ones that have practical applications.40 The richness of Northwest Coast First Peoples' connections with biodiversity is reflected perhaps most famously in their world-renowned art forms, which represent animals, birds, fish and other beings in totem poles, masks, dishes, jewellery, sculptures and paintings.41,42,43 These designs represent key figures in the histories of families, clans and individuals. Their immense power and compelling form symbolize the depth of human reliance on biodiversity. © 1994 UBC Museum of Anthropology This map is regularly revised. Latest revision October 15, 1996. No reproduction without permission. Pacific salmon: Five species of Pacific salmon - chinook (Oncorhynchus tshawytscha), chum (O. keta), coho (O. kisutch), pink (O. gorbuscha) and sockeye - as well as steelhead (O. mykiss), are a key economic, nutritional and cultural resource for First Nations in both coastal and interior B.C. Fresh, dried or smoked salmon, as well as salmon eggs and salmon oil, have been widely traded by First Peoples since pre-European times. More recently, salmon has formed the basis of a major commercial fishery and cannery industry that has supported many First Nations communities. First Peoples have been important stewards of salmon populations and their habitats. Western redcedar: Known as a sacred tree, western redcedar is the cornerstone of Northwest Coast Aboriginal culture. It is prized for its important and varied uses in material technology and ceremonial purposes. Edible red laver seaweed (Porphyra abbottiae): This marine alga is an important food source for Aboriginal people in coastal areas. It is valued not only for its nutritional properties, but also as a gift or trade item and for its medicinal uses. Wapato (Sagittaria latifolia var. latifolia): Also known as the Indian swamp potato by the Katzie and other Sto:lo peoples of B.C., wapato was a traditional staple root vegetable and valued as a trade item. The maintenance of wapato patches by particular families was an important part of First Peoples' community structure, which was disrupted as wetlands in the Fraser River valley were converted to intensive agriculture, decreasing the amount of habitat suitable for growing wapato. Geologic history and landscape age play key roles in shaping the biodiversity of a region. In general, old, stable landscapes support more species than young ones because there has been more time for variation to evolve. As well, geologically old regions often have had numerous geographic connections with sources of new life forms from other regions. Landscapes with complex geological histories also tend to have more habitats because the land surface is diverse. Global geological processes during the past 100 million years have variously connected and separated B.C. from regions to the east, northwest and south, bringing infusions from a wide range of ecosystems and species and fostering local evolution. For much of the Cenozoic Era (the period of geological history that spans the past 65 million years), the B.C. region was part of a warm, temperate, broadleaf forest biome, which provided the raw materials for modern terrestrial biodiversity63 and extended across the northern hemisphere. As terrestrial ecosystems developed in the Cenozoic Era, marine biodiversity was largely being shaped by migrations north and south along the Pacific Coast as global temperatures fluctuated. Coastal marine ecosystems developed a north-south pattern of zones. During this period, the oldest fossil member of the salmonid family, Eosalmo driftwoodensis, inhabited lakes and rivers that drained into the Pacific Ocean.64 Shoreline ecosystems of 25 million years ago were broadly similar to those of today and many constituent species of that time have modern relatives. In B.C., extensive subalpine spruce (Picea spp.) and mountain hemlock (Tsuga mertensiana) forests and parkland prevailed between about 48,000 and 30,000 years ago.70,71 Wetlands seem to have occurred widely and rivers and lakes may have had relatively high sediment loads. The most widely recognized B.C. refugia are high-elevation sites and some adjacent slopes on Haida Gwaii/ Queen Charlotte Islands and the Brooks Peninsula on Vancouver Island.79,80 In these areas, alpine and probably high-elevation, cool oceanic ecosystems persisted, resulting in a unique set of plant species and subspecific lineages endemic to the region. DNA studies of mountain sorrel (Oxyria digyna), a globally widespread alpine plant, also suggest there were ice-free zones for alpine species in northern B.C., possibly with connections to Beringia.81 These studies also confirm the presence of refugia on the north coast. Although it is not known to what extent low-elevation sites were included in the refugia, the studies indicate a potentially high level of genetic diversity and globally unique biodiversity in the region. Despite the existence of refugia, a key feature of the last glacial interval is that B.C. had no extensive conifer forests as we know them today, though scattered coniferous trees (e.g., subalpine fir [Abies lasiocarpa] at high elevations in the south and lodgepole pine [Pinus contorta var. latifolia] along the coast) may have persisted. 82,83,84 The province's modern forest ecosystems developed during the past 14,000 years, as ice-age climates ended. In some respects, the ecosystems of this transition time might have looked familiar, though out of place to modern observers. For example, for several thousand years, open, dry, cold lodgepole pine forests extended along the B.C. coast to Alaska, forming a distinctive biome.88 In the interior, cold sagebrush and grassland ecosystems likely predominated.89 Tundra-like ecosystems spread across the north of the province. Moist, cool mixed-coniferous forests featuring mountain hemlock developed for about a thousand years (12,000 to 11,000 years ago), from the pine biome along the coast down to present-day sea level.90 These ecosystems reflected the cooler-than-present climates of the day. In one major respect, however, life in the late-glacial period differed from what we see today, as it included the now-extinct megafauna. Mastodons (Mammut americanum), giant bison (Bison antiquus), woolly mammoths and giant ground sloths (Megatherium americanum) roamed parts of B.C., including southern Vancouver Island.91 These animals clearly influenced the ecological processes, structure and composition of plant communities. In addition, a new species - humans - began to depend upon and influence B.C. 's evolving biological diversity. Extensive tracts of open ecosystems related to modern non-forest communities occurred widely during the warm dry early Holocene interval. Many herbaceous and shrubby species of open terrain (e.g., sagebrush) became well established in late glacial times, especially during drier phases. To these were added species that migrated from the south following newly available warm to hot, dry valley bottoms and slopes, each according to its natural rate of dispersal. In the southern interior, valley-bottom grasslands stretched through a series of elevation zones upslope into alpine heights, forming a large area suitable for rangeland dwellers.104,105 Extensive steppe ecosystems reached as far north as the latitude of Quesnel. Along the south coast, sea levels were at least 10 m lower than today and many coastal meadow species that are now uncommon, restricted or rare spread throughout the Georgia Basin.106 Treelines were at higher elevations than today and the alpine region was less extensive in the south. Freshwater environments were generally warmer and shallower than today, with some smaller water bodies being ephemeral.108 Water chemistry tended toward neutral or even alkaline and marl-depositing communities occurred widely in the southern interior. Marshes and swamps were dominant types of wetlands. The latter part of the Holocene Epoch saw cooler temperatures than in the preceding 6,000 years, which, combined with relatively abundant moisture, fostered forest and wetland expansion. During this period, the modern pattern of ecosystems became well established and glaciers and ice fields expanded widely at high elevations.